We observe the sky as it looks, not as it is. You feel like you are on top of the Earth (the result of gravity drawing you toward the Earth's center). In the example, you are at a latitude (your location along an arc from the Earth's equator to the rotation pole, given by lower case Greek letter Phi) of 45°, halfway between the Earth's equator and the north pole. The latitude of the north pole is 90°, that of the equator 0°. The Earth appears to lie at the center of a fictional celestial sphere. You pretend that you are inside the sphere at the center looking out around you. Above your head is your zenith, while directly below you is your nadir (both of which are points on the celestial sphere). In between is the great circle of the horizon, which is the circle on the celestial sphere cut by a plane tangent to the Earth at your feet. Everything in the sky above the horizon is visible, while everything below it is not. The celestial sphere is tipped relative to the observer in the same way as is the Earth. 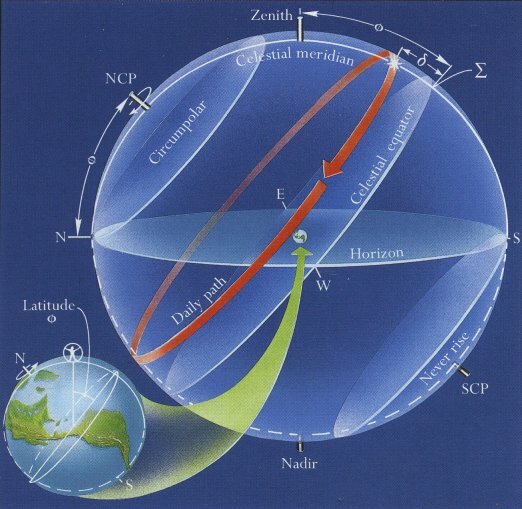 The extension of the Earth's rotation axis to the sky defines the North and South Celestial Poles (the NCP and SCP), while the extension of the Earth's equatorial plane defines the celestial equator. The NCP is in the constellation Ursa Minor (the Smaller Bear) close to the direction of the star Polaris, otherwise called the North Star. The SCP is in the modern constellation Octans, the Octant, in the general direction of the faint southern pole star Sigma Octantis (Polaris Australis). 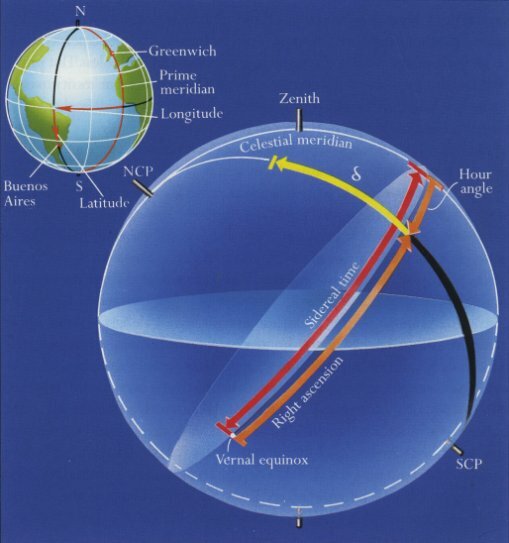 The circle that runs through the zenith, nadir, NCP, and SCP is the celestial meridian. The intersection of the celestial meridian and the horizon define north (N) and south (S), while that between the equator and the horizon define east (E) and west (W). The intersection of the celestial meridian and the celestial equator (upper case Greek letter Sigma) is down from the zenith by an angle equal to the latitude. The Earth rotates about its poles from west to east (counterclockwise as viewed from above the north pole), which makes the sky seem to rotate in the other direction about the north and south celestial poles parallel to the celestial equator. The elevation above the horizon (the altitude) of the NCP always equals the observer's latitude. If you are in the southern hemisphere, the south celestial pole (the SCP) is above the horizon, the NCP below it. A star on the celestial sphere seems to go around the observer on a daily path (red circle). The perpendicular angle of a star north or south of the celestial equator is given by its declination, indicated by lower case Greek letter Delta. When the star drops below the horizon, it sets, while when it comes up above the horizon it rises. A star on the celestial equator rises exactly east, sets exactly west. The greater the declination, the farther north of west the star both sets and rises. If far enough north (declination 90° - latitude), the star misses the horizon and is circumpolar, that is, always visible. If the declination is far enough south, the star does not get above the horizon and is always invisible. Though in truth the Earth orbits the Sun, we feel stationary, which makes the Sun appear to go around the Earth once a year in the counterclockwise direction (from west to east, counter to its daily motion across the sky) along a steady path called the ecliptic. Since there are 365 (actually 365.2422...) days in the year, and 360° in the circle, the Sun moves to the east at the slow pace of only a bit under a degree per day. At the same time it is constantly moving (rather, appearing to move) from east to west as a result of the Earth's rotation, just at a pace slightly slower than the stars because of its simultaneous easterly drift. The perpendiculars to the ecliptic plane define the ecliptic poles. The North Ecliptic Pole (NEP) is in Draco, the South Ecliptic Pole (SEP) in Dorado. The Earth's axis is tilted relative to the perpendiculars to the ecliptic plane by an angle of 23.5° (actually closer to 23.4°). The tilt separates the celestial and ecliptic poles by the same angle, which causes the circle of the ecliptic to be tilted relative to the celestial equator again by the same angle, which as a result is called the obliquity of the ecliptic. As it moves along the ecliptic against the background stars, which are there even if you cannot see them against the blue sky, the Sun therefore appears also to move north and south of the celestial equator. As the Sun traverses the ecliptic path, it appears to move against a band of 12 ancient constellations called the Zodiac, which are given in traditional order are shown below. The second line for each entry gives the average date on which the Sun enters the constellation according to the official boundaries established in 1930 by the International Astronomical Union. They depend somewhat on the proximity of a leap year. The modern boundary of Ophiuchus (the Serpent Bearer) is crossed by the ecliptic between Scorpius and Sagittarius, making it an unofficial thirteenth constellation of the Zodiac. It has no standing as part of the classical, traditional Zodiac, however. The Sun enters it November 30. As the Sun moves north of the equator from the Vernal Equinox, it rises and sets progressively more to the north of east and west. Days gradually become longer than 12 hours, nights shorter. On June 21, the Sun reaches its most northerly extent (as seen in the right-hand "Earth" in the illustration), at a declination of 23.5 degrees north at the Summer Solstice, to begin northern- hemisphere summer (southern hemisphere winter). It then rises as far north of east and sets as far north of west as possible. Northern hemisphere days are now the longest of the year, nights the shortest, the extent of the effect dependent on latitude. Conversely, following the autumnal equinox, as the Sun moves south, it rises and sets progressively farther south of east and west. Northern hemisphere days now get shorter (less than 12 hours), nights longer (greater than 12 hours). On December 22, the Sun reaches its most southerly extent (see the left-hand "Earth"), at a declination of 23.5 degrees south, at the Winter Solstice to begin northern-hemisphere winter (southern hemisphere summer). It then rises as far south of east and sets as far south of west as possible. Northern-hemisphere daytime is now minimized, nighttime maximized. All the effects are reversed in the southern hemisphere, while at the Earth's equator, days and nights are always equal at 12 hours. Above the Arctic Circle at latitude 66.6° north (and below the Antarctic Circle, latitude 66.6° south), the Sun can be circumpolar in the summer, yielding 24 hours of sunlight and a midnight Sun). The farther north of the Arctic Circle (or the farther south of the Antarctic Circle), the more days of midnight Sun you will see. In the tropics (between latitudes 23.5°N at the Tropic of Cancer and 23.5°S at the Tropic of Capricorn) the Sun can be overhead sometime during the year (on June 21 at the former, on December 22 at the latter). Your location on Earth is expressed through your latitude (your north-south position; see above) and longitude, which gives your east-west position. Draw a circle called a meridian from the north pole through your location to the south pole, then do the same through Greenwich, England to define the prime meridian, and note where they cross the equator. Your longitude (given by lower case Greek letter lambda) is the angle between the two intersections (of the meridians and the equator). In the illustration, the latitude of Greenwich is 51° 29' North (the longitude is by definition zero); those of Buenos Aries are 34° 35' South, 58° 29' West. There are 60 minutes (') in a degree of angle, 60 seconds (") in a minute. Star time, properly called sidereal time, is the hour angle of the Vernal Equinox. Because the Sun moves to the east along the ecliptic, the Sun takes longer to make a circuit of the sky on its daily path than does a star or the equinox, so the solar day is 4 minutes longer than the sidereal day. As a result, the sidereal clock gains 4 minutes (actually 3 minutes 56 seconds) per day over the solar clock, starting from the time of solar passage across the autumnal equinox on September 23, when the two are the same. The right ascension of a star or any other celestial body (given by the lower-case Greek letter alpha) is the angle the body makes with the vernal equinox as measured to the east, again along the celestial equator. It too is usually measured in time units. The right ascension and hour angle of a body always add to equal the sidereal time. Given the sidereal time and the right ascension of a body, you can compute its hour angle, which with the declination allows you to set a telescope and to find anything in the sky. Because of rotation, the Earth bulges slightly at its equator (greatly exaggerated in the drawing to the left; the difference between the equatorial and polar diameters is only 40 kilometers). The gravity of the Moon and Sun acting on the bulge causes the Earth's rotation axis to wobble around the perpendicular to its orbit with a period of 26,000 years, the phenomenon called precession. 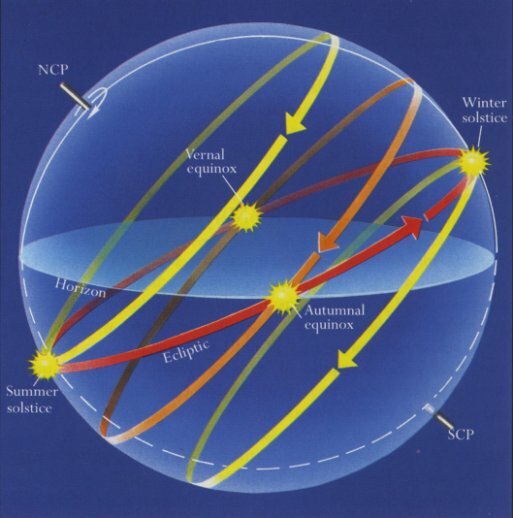 Precession causes the celestial poles (the NCP and the SCP) to move in circles around the ecliptic poles (the NEP and SEP), which changes the pole stars. In ancient Egyptian times, for example, the North Celestial Pole (NCP) pointed close to Thuban in Draco (the Dragon). Precession also causes the plane of the Earth's equator to wobble, which changes the directions of the equinoxes and solstices against the background stars (continuously altering the right ascensions and declinations of stars, though in a precisely known way). In ancient times, the Vernal Equinox was in Aries, which is why that constellation tops the classical list. In classical times the Summer and Winter Solstices were in Cancer and Capricornus, hence the names "Tropic of Cancer" and "Tropic of Capricorn." Our astronomical roots are deep indeed. As a result of precession, around 1990 the Summer Solstice crossed the modern boundary from Gemini to Taurus, which now technically holds the point. Because the Summer Solstice is closer to the classic figure of Gemini than it is to that of Taurus, and since Gemini (along with Pisces, Libra, and Sagittarius) quarters the ecliptic, Gemini is still traditionally taken as the Solstice's celestial home. Figures are from STARS, James B. Kaler, Scientific American Library, Freeman, NY, copyright © James B. Kaler. To learn more about this subject, see The Ever-Changing Sky, James B. Kaler, Cambridge University Press, 2002. Copyright © James B. Kaler. All rights reserved. These contents are the property of the author and may not be reproduced in whole or in part without the author's express consent except in fair use for educational purposes. Thanks to reader number .